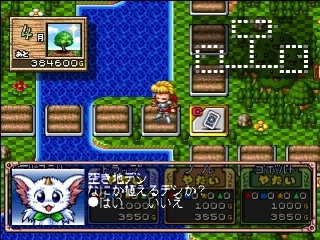 Menus and gameplay are in Japanese. 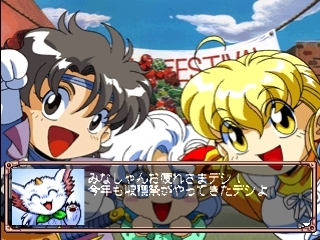 Shin Fortune Quest - Shokutaku no Kishi-tachi is a board game based in the Fortune Quest anime series. 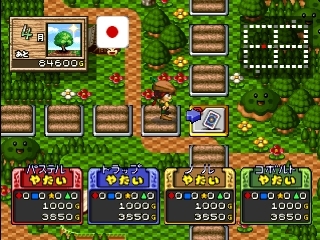 The gameplay is about playing in a board to grow food by planting seeds in the field and get the money by selling the crop harvested in October of each year. 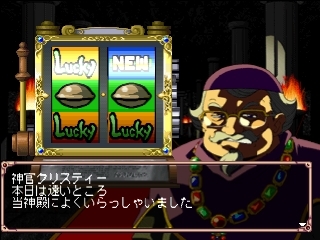 Every four year takes place a cooking contest and the jury will be the other four unused characters, and if the player character's win he will be rewarded with money and medals. 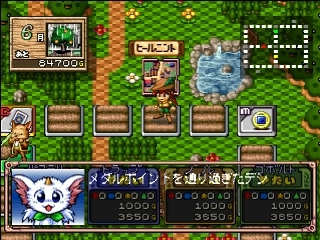 The game features 7 different board maps to play in, different characters to choose and up to 4 human players can play at the same time. 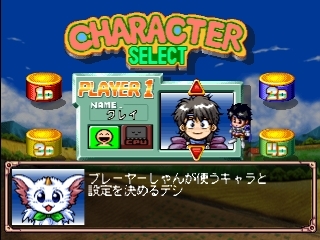 The game features also a omake mode with all the main characters descriptions and voices. Our story is set in another world, parallel to ours. 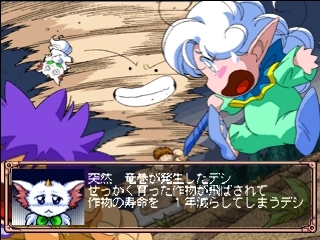 We meet Pastel, an orphan girl, 18 years old, who lives with a group of adventurers in a small house. 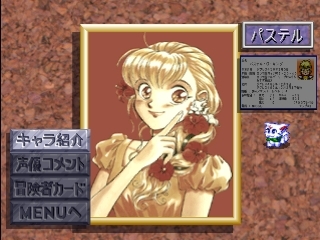 Pastel works as a writer and also a "mapper", charting towns, the countryside, rivers and mountains with sketches and illustrations. She is highly respected by her friends as her intelligence and honesty are extraordinary. 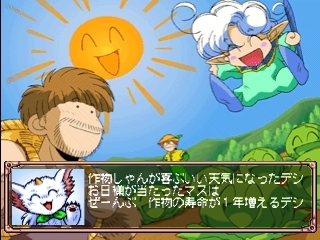 Living in the house with Pastel, we meet Clay, a young swordsman; Trapp, the son of a bandit chieftain; Kitton, literally a working dictionary and a descendant of the Family Kittons; Knoll, a big guy a with tender heart; Whitey, a baby dragon; and Rumy, an infant sorcerer of the tribe "Elf." Together this odd group become involved in many mysterious adventures from treasure hunting, to searching for a missing person, to challenging a riddle, to many more unexpected quests. With Pastel's outstanding brain, Clay's courage and friendship, and the cooperation of all the other members, this special group is sure to triumph over the most awesome of circumstances. Their goodness guides their actions and in this way, they are blessed. - Pastel G. King: A cheerful 16 year old girl who has tremendous curiosity and inquisitiveness. Although she is bright and thoughtful, she has a tendency to jump to conclusions. Her parents passed away some time ago. She is a poet and an artist and she earns her living by writing books of their Quests and illustrating maps of their journeys..
- Clay S. Anderson: The leader of the Group. He is a descendent of the noble family of the Knight Troop of the Ronza Kingdom. Like his grand father, who was the legendary "Blue Knight", Clay is a man of honor, responsibility and moral. The long sword, which he inherited from his ancestors, is his most proud possession next to his life. He keeps it in perfect condition always. 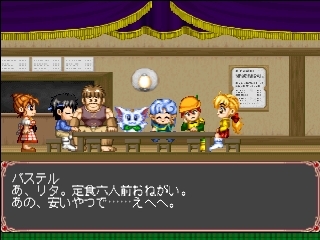 Though he has a strong sense of justice, he feels he was not an aggressive fighter. - Trapp: A childhood friend of Clay's. Trapp is the product of a bandit family. He is very agile and quick-witted. 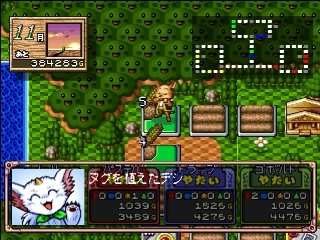 When a battle starts he shows his natural sense in full by slipping away to safety with amazing speed. 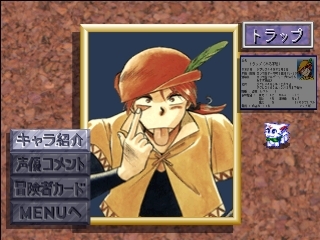 Very realistic and shrewd unlike other members of the Group, his sharp-tongue often bothers the others. He's excellent at sling-shot. - Kitton: He is believed to come from a royal lineage, "The Kittons". This is not known for certain as he has amnesia. 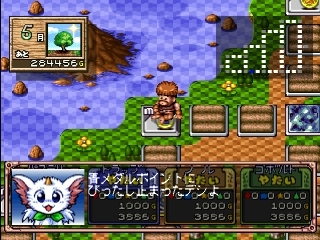 He has a strong desire to learn, especially pertaining to herbs. 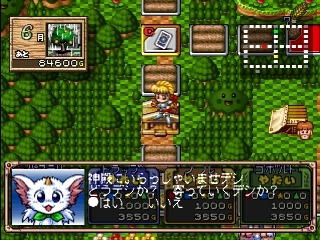 His mini-picture book is very useful when the group encounters danger. He is extremely indifferent to cleanliness and hygiene and he dislikes taking a bath and or cutting his hair.. His profession is a farmer. - Knoll: A big man from "Gigantis." Height 2 meters. Weight 120 kilos. Atypical of a man who possesses tremendous strength, he is quiet and tender-hearted. He is looking for his two sisters who have disappeared without cause. 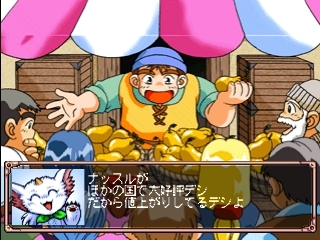 He can talk with certain birds and animals. His job is a carrier, pulling a cart containing all the belongings of the Group. His hobby is playing cat's cradle. - Rumy: An infant girl of the "Elves to the Sorcerers". 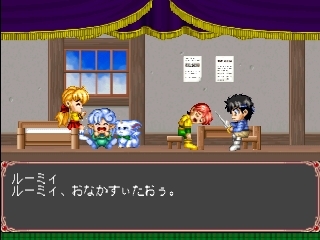 Although she is able to play weak magic of "Fire", "Cold', "Stop" and "Fly," it is not very useful to the group. She sticks to Whitey, the white dragon. - Whitey: The baby dragon of the legendary White Dragon who's said to bring happiness. He can emit two kinds of blows, "Hot" and "Dazzling." He is small like a puppy usually, but can make his size 10 meters big for a short period of time. He can even fly a little in a clumsy way. He disguises himself as a puppy. Problem is he can not bark well like a dog. 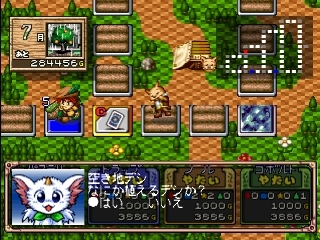 Popular fantasy, "Fortune Quest"has become a board game format sugoroku PS appeared. Across the world suffer from food shortages, food make a plowed field with everyone. The field has become a field, sowing seeds grow food has its own system will get the money by selling the crop to be harvested in late October each year. 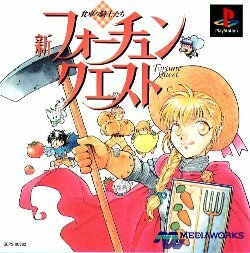 Medieval, Farming, Fantasy & Anime themes. Vibration Compatible The game doesn't have it (Digital only). NOTE: This is not the only possible combination of plugins. There are others that will work (better or worse) for your particular hardware. We provide you with one working set-up so that you may get the game up and running, hassle-free. 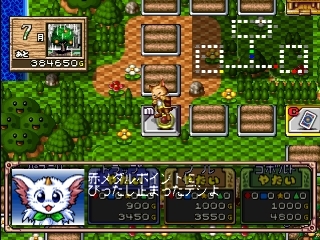 Testing other emulators/plugins is up to you. Dim. - 505 x 512 pix. Dim. - 682 x 512 pix. Dim. - 616 x 876 pix. Dim. - 617 x 876 pix. Thanks to BADSECTOR for providing the game covers. Gameshark code created by GLADIATOR. We couldn't find some of the information and covers for this game. When more accurate information or covers are obtained, the entry will be updated adding the missing information. If you have information or covers that would complete this entry, please feel free to contribute them by clicking the CONTRIBUTE link in the menu on the left. You will find instructions on how to proceed.